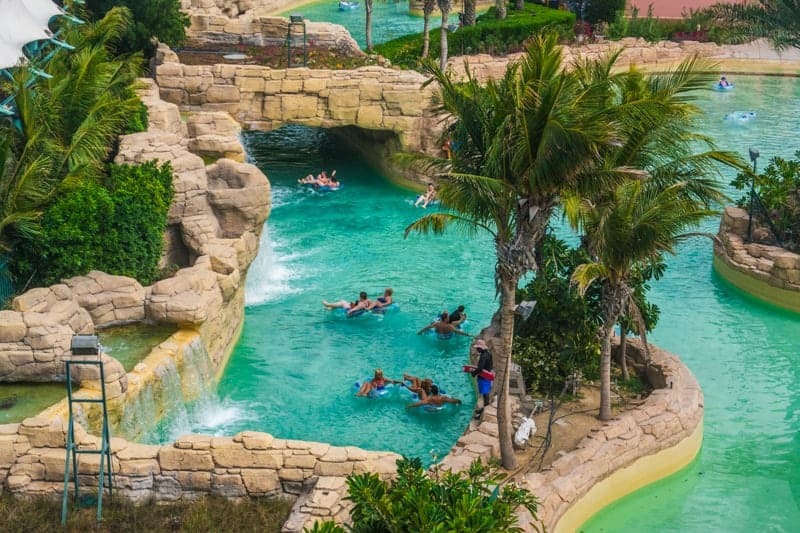 Aquaventure is a large waterpark at the Atlantis resort on the Palm Jumeirah. It features numerous waterslides, river rides, play areas, and a private beach. 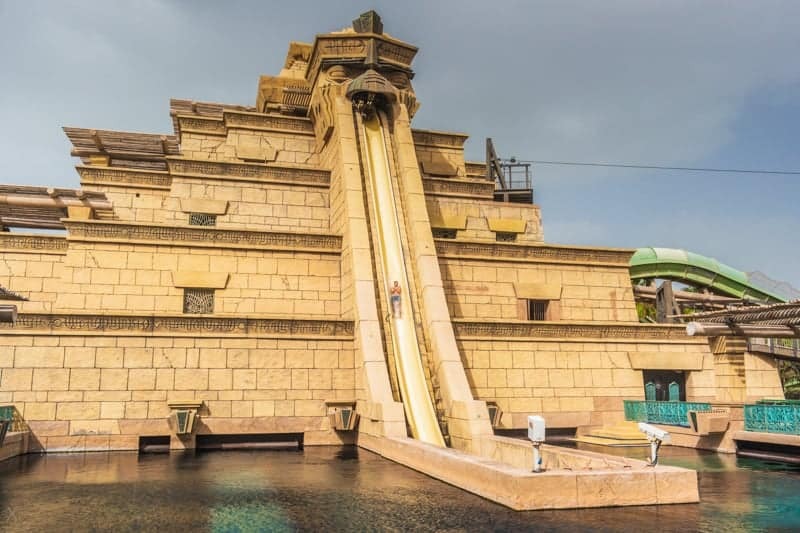 The highlight for thrill seekers is the Leap of Faith, a slide with a near-vertical 27 metre drop that shoots riders into a transparent tunnel surrounded by a shark-infested lagoon. Slightly less daunting is The Rapids, a white water river ride with caverns and waterfalls. 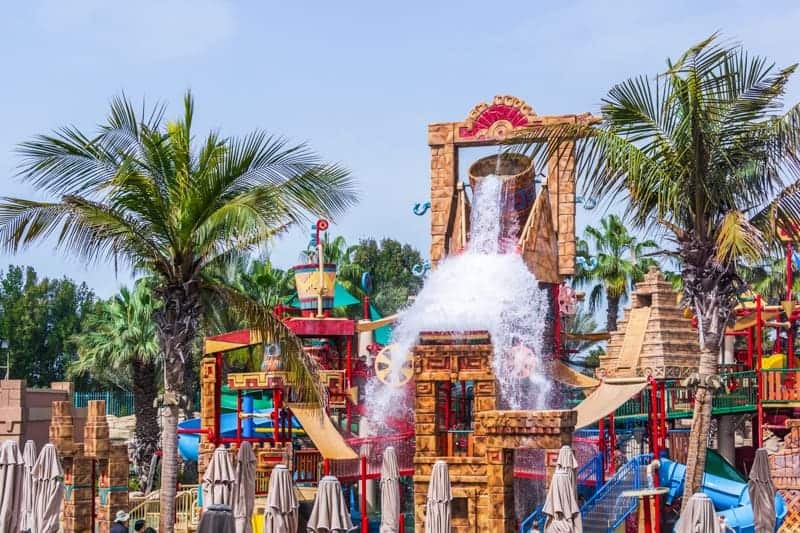 For young children there’s Splashers, a water playground with slides, water buckets and jets. Visitors can take time out from the excitement and relax on the private beach. The waterpark is open daily from 10 am until sunset. Children under 12 must be accompanied by an adult. Entrance to Aquaventure is free for hotel guests. Others need to purchase day tickets. For current prices and online ticket bookings visit the official Atlantis website. Atlantis is situated on the crescent of the Palm Jumeirah. There are no Metro stations here. Visitors can drive, catch a taxi, or take the Palm Jumeirah Monorail from Al Sufouh. Ossiano (0.3 miles) - Upmarket seafood restaurant at Atlantis the Palm. Features an incredible dining room with floor to ceiling views of the hotel’s aquarium. Ayamna (0.3 miles) - Lebanese fine dining restaurant at Atlantis the Palm. Live music and entertainment. Indoor and outdoor seating. 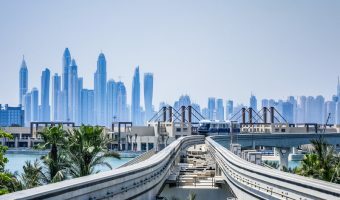 Palm Jumeirah Monorail – Atlantis Aquaventure Station (0.1 miles) - Monorail station next to the Atlantis hotel and Aquaventure waterpark. Map showing location of Aquaventure. It is a good waterpark with lots of rides. I think both the entrance and food are overpriced though. It should be cheaper. I think they would actually make more money if the prices were cheaper as more people would go. 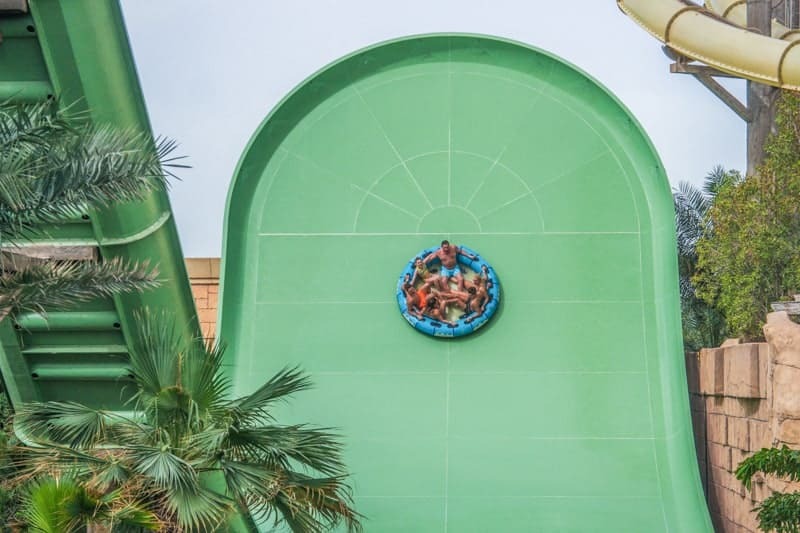 Aquaventure is a great park, even for a seasoned waterpark lover such as me. It is medium size but has something for all ages and levels of bravery. The highlight for me was Shark Attack. You go down a dark tube slide and exit into a glass tube. The pace slows down and you are surrounded by sharks. Don’t worry though. There’s glass between you and the sharks so they can’t get at you. I didn’t take any valuables and didn’t get a locker, but felt safe enough leaving my belongings on the lounger. This is a great waterpark in an impressive hotel complex. We got free entry because we were staying at Atlantis. I’d advise anybody thinking of visiting to go first thing in the morning. It is cooler and there are less people about so you don’t need to queue for as long. We had to decide between Wild Wadi and Aquaventure and chose Aquaventure. I’m glad we did. Due to the time of year it wasn’t too busy so could go on lots of rides without queuing for very long. Some of the rides were quite scary and not for those who get nervous about such things. We visited the park while we were staying at Atlantis. There was a good selection of rides. It quite busy but there wasn’t much queuing. 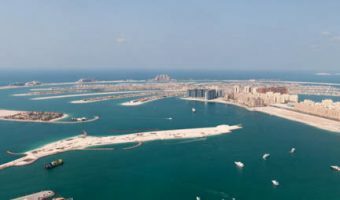 Guide to the Palm Jumeirah. Includes hotels, things to do, details of how to get there, and an interactive map.